After approximately 4hrs of sleep last night, I’m not feeling particularly blissful about my bump today. Chronic heartburn that jumps so high it singes my ears and a hyperactive breech baby, keen to explore its Irish roots with a bit o’ dancing on my cervix ensures that the only bliss I’m likely to find in my expanding bump for now is my new-found ability to rest a cup of tea on it. Having said that, there’s something to be said for my current condition. Mostly based around the opportunities to stuff my face with gleeful abandon and use all manner of lotions and potions in the name of baby-bump pampering. Of course, there are many companies out there only to happy to help us ladies nurture our bumps in the way in which our beauty-loving souls desire. 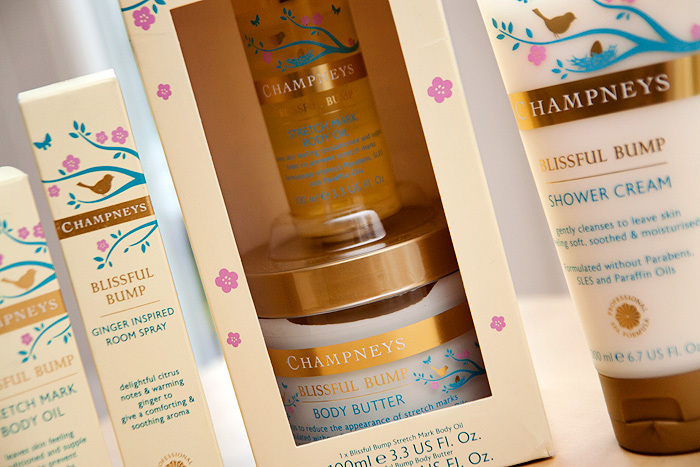 One of these brands, better-known for their health and spa resorts are Champneys. Their Blissful Bump* range features a host of preggo-belly indulging goodies that make great gifts for Mum’s to be. The brand sent me a few bits from the range to have a look at, and I’ve welcomed the bonafide opportunity to tell the rest of my family to bugger off away from my shower treats. Did I tell you that my 4yr old has genuinely stolen my NEOM tranquility bath foam and even offered up her Matey bubble bath like it’s a legitimate replacement?! I’ve created a monster. Anyway, back to the range from Champneys! My favourite item in the range is the Ginger Inspired Room Spray… which wasn’t the most obvious choice but any kind of obnoxious smells are like Kryptonite to my preggo-nose and I’m ridiculously sensitive to the fact that our car smells a bit like a turnip. Of course, I’m the only one who can actually detect this aroma (unless my husband is messing with my mind and does actually have a turnip concealed in the glove compartment). I usually swear by a tin of California Scents Coronado Cherry to make the car smell amaze but my sensitive nose has gone into overdrive and the Champney’s Ginger Inspired Room Spray is the only scent room/car fragrancer that I can handle. I’m sure Champneys actually intended far more sophisticated uses for their product in the boudoir… but disguising turnips in my Citroen Picasso will have to do for now. My second-favourite item in the range is the Blissful Bump Shower Cream which delivers a rich, creamy lather and delicious scent. It’s a skin-softening wonder and leaves me feeling lush and pampered. At £6.00, it also happens to be the cheapest item in the range. Who says I’m high-maintenance? The spa brand also offer a couple of bump-moisturising products in the form of a stretch-mark oil and a body butter. If you’ve been following me for any length of time, you’ll know how terrible I am at bothering with body-moisturising but what you might not know about me is that I have a solid belief that nothing will prevent stretch-marks, nothing that can be applied and rubbed in anyway. In my opinion, you’re either genetically destined to get ’em, or you ain’t. That’s not to say that moisturising your bump like a loon is a thankless task, but I just don’t believe that it will achieve anything other than soft skin. So knock yourself out… but don’t bother telling me that religious use of Bio Oil on your bump saved you from a road-map of the Swiss Alps across your belly ‘cos I just won’t believe you! The entire body range has been formulated to be free from parabens, paraffin oils, and SLES, focusing on the importance of conditioning and soothing the skin. The scents used are beautiful, the packaging… divine. The prices are high-street friendly and make the perfect gift for family and friend’s who are expecting.